As California enters the winter rainy season, at least one transplant won’t be disappointed to see a change in the weather. West Coast rain is just fine for the house centipede, a guest from the Mediterranean that favors the dark, humid corners of people’s homes. Not to be confused with their herbivorous cousins the millipedes, centipedes are aggressive predators that use venom to subdue their prey. 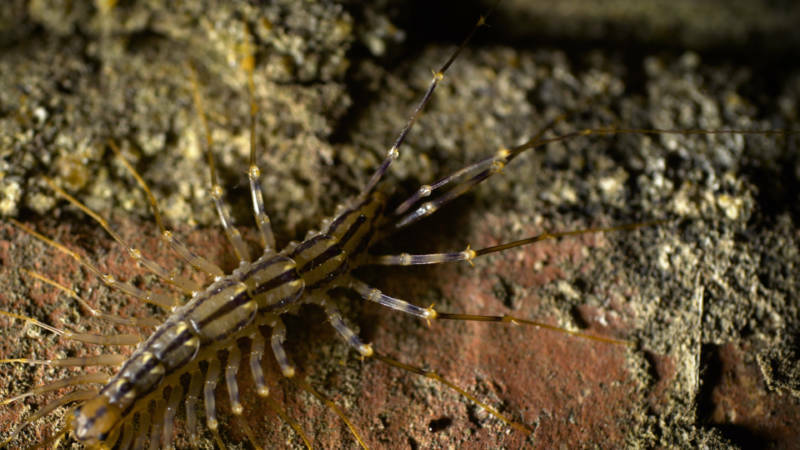 Even though they are often targeted for pest control, centipedes are some of nature’s best exterminators, emerging by night from their crevices to feed on cockroaches, flies, bedbugs, crickets, spiders and snails. 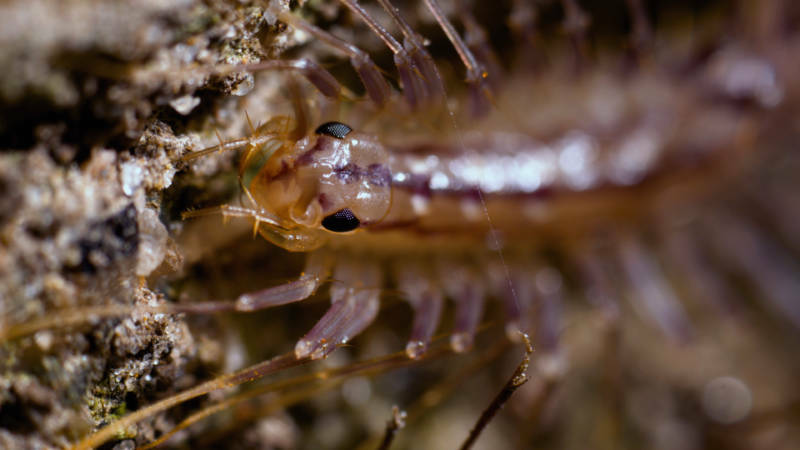 The house centipede’s legs get progressively longer toward the rear, which creates its characteristic outline and keeps them from getting tangled when they are running fast. And they can run fast -- about 16 inches a second, which is pound for pound about the same as a human running 42 mph. If 30 legs sound like more than one critter really needs -- perhaps it is. Over the last 450 million years or so, when centipedes split off from other arthropods, evolution has turned some of those walking limbs into other useful and versatile tools. 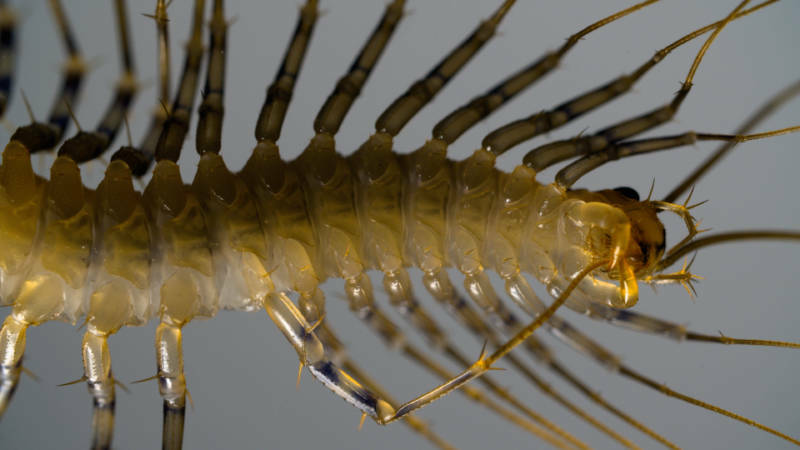 The centipede’s venom-injecting fangs, called forciples, are also modified legs. Though shorter and thicker than the walking limbs, they are multijointed , which makes them far more dexterous than the fangs of insects and spiders, which hinge in only one plane. Because of this dexterity, the centipede’s forciples not only inject venom, but also hold prey in place while the centipede feeds. Then they take a turn as a grooming tool. The centipede passes its legs through the forciples to clean and lubricate their sensory hairs. “All those hairs need to be kept clean, so they groom pretty regularly,” said Edgecombe. New research from scientists in Germany has identified another way the house centipede may be repurposing some of its many limbs, this time at the other end of the body. The research focuses on the critter’s hindmost legs, which rival its frontal antennae in length. Scientists have long noticed that because of their length and the fact that the centipede holds them aloft when it walks, these back legs give the appearance of a second pair of antennae. The house centipede looks like it has two heads. The new research suggests that’s not the whole story with the house centipede. When Andy Sombke and Matthes Kenning from the University of Greifswald turned an electron microscope on the centipede’s legs, they found as many sensory hairs, or sensilla, on them as on the antennae. “We asked whether these legs represented some kind of antennae at the back or the end of the body,” said Sombke by email. The presence of so many sensory hairs suggests the centipede’s long back legs are not merely dummies used in a defensive ploy but serve a special function, possibly in mate selection. During courtship, both the male and female house centipede slowly raise and lower their antennae and back legs, followed by mutual tapping and probing.